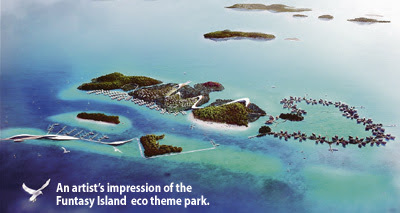 KUALA LUMPUR: Resort developer Funtasy Island Development Group has unveiled its multi-million-ringgit eco theme park project called Funtasy Island. Funtasy Island Development is expected to complete the first phase of the construction with the exclusively built aqua villas by 2013. Founder and creator Michael Yong said the project is expected to attract of a steady clientele as investors, property owners and tourists have expressed an interest in the project. He believes the project will benefit Asean. "Due to its proximity to ... Malaysia, Indonesia and Singapore, this project will be advantageous to stakeholders and the public in terms of logistical supplies, human resource and greater business activities for Malaysia, Singapore, Hong Kong and other Asian cities," Yong said at the official launch of the project in Hong Kong on September 12. Funtasy Island, covering 3.28 million sq m, will be made up of six islands south of Singapore's Sentosa Island and near Batam Island in Indonesia. Facilities at the Eco Park will include world's largest ecological theme park, water sports club, aquatic breeding zone, restaurants, retail outlets, cafes and others. Funtasy Island Development has a strong presence in China, Hong Kong, Indonesia and Malaysia, and has developed Bali Resort City, Xsport Senayan, Pluit Mega Mall in Jakarta, IBN Tower in Batam, and Novus Gawana Resort in Bali. JOHOR BARU: More investments are coming into the hospitality industry in Iskandar Malaysia from domestic and foreign players within the next three years, which will add 3,000 more rooms in the region. No less than four hotels and service apartments have pledged to provide at least 3,000 more rooms in Iskandar Malaysia by 2014. The investment is timely as it coincides with the opening of the Kulaijaya Premier Outlet this November and Legoland in Nusajaya in the third quarter of next year. They include the 900-room KSL Resort in Taman Century; the 198-room Granada Hotel in Bukit Indah; the 300-room Renaissance Hotel in Permas Jaya; the 292-room Traders Hotel in Nusajaya; and the 293-room Palazzo Hotel and Serviced Suites at the Danga Bay. Johor Menteri Besar Datuk Abdul Ghani Othman said Iskandar Malaysia may not have sufficient rooms to cope with the influx of tourists to the premier outlet and theme park in the next two years. He said things will change by 2014 when Iskandar Malaysia will have more star-rated hotels and serviced apartments. "By then, we have quality rooms for visitors, as well as serviced apartments for professionals and expatriates who are likely to relocate to Johor for jobs," he told reporters after the ground-breaking ceremony of the RM105 million Palazzo Hotel at Danga Bay on Saturday evening. The 27-storey hotel will be developed by Lentang Cahaya (M) Sdn Bhd, a wholly-owned subsidiary of the Waz Lian Group. It is expected to be ready in the second quarter of 2014. Ghani said Dijaya Corporation had announced plans to develop a luxury serviced apartment, while the Danga Bay Group is planning to build no less than two major hotels at the marina area in Danga Bay. Moving over to the east coast of the state, he said Khazanah Nasional Bhd is working on a multi-billion ringgit development plan to transform Desaru into an integrated and premier lifestyle destination. "In the pipeline is the building of two international class hotels and a golf course. "There will also be a theme park with a tropical eco-adventure and water features, as well as a convention centre," he said. Ghani said the recent opening of the Senai-Desaru Expressway has improved accessibility to the east coast significantly, thus, more hospitality investments are expected to pour into Desaru. UEM Land Bhd's acquisition of Sunrise Bhd, which developed Mont'Kiara in Kuala Lumpur, created the country's largest property development company by market capitalisation. PETALING JAYA: When Sime Darby Bhd acquired a 30% stake in Penang-based Eastern & Oriental Bhd, it was just the latest in a series of acquisitions led by government-linked companies (GLCs) in private sector property developers. Late last year, government-owned UEM Land Bhd acquired Sunrise Bhd to create the largest property development company in Malaysia by market capitalisation. Last year too, Malaysian Resources Corp Bhd (MRCB) and IJM Land Bhd proposed a merger which would have created the country’s second largest property player with a market capitalisation of over RM7 billion and a landbank of over 9,000 acres (3,600ha), but the deal fell through. Analysts and market observers speculated that it was because neither could decide who would lead the merged entity. In addition, most of the private property developers now have a major government-related shareholder, usually a fund. For instance, S P Setia Bhd’s two largest shareholders are Skim Amanah Saham Bumiputera (20.1%) and the Employees Provident Fund (15%), while its CEO Tan Sri Liew Kee Sin owns a 12% stake, according to its latest annual report. In the case of Mah Sing Group Bhd, managing director Tan Sri Leong Hoy Kum holds a 35.2% stake while various government-related funds such as Koperasi Permodalan Felda Malaysia Bhd, Permodalan Nasional Bhd, the EPF, Kumpulan Wang Persaraan and Valuecap Sdn Bhd collectively own a 20.8% stake, according to its latest annual report. “What we notice is that the government or GLCs are buying into private sector companies. We can’t help but wonder if this is the crowding out effect and if the government is looking to become a dominant player in the property sector,” said an analyst. In Hong Kong or Singapore, the government’s role in property development is clear cut: to ensure the steady release of land to avoid either overbuilding or excessive speculation and to ensure the availability of affordable housing for the population. “Over here, the government is mainly buying into developers that operate mainly in the high end of the market. In other words, not the ones that build affordable residences,” he said. On the other hand, there is almost an equal urgency to privatise parcels of government land in strategic areas. In 2009, the government decided to swap a 62.5-acre piece of prime land in Mont’Kiara for a RM628 million trade and convention centre by the Naza Group. It is also privatising the 495-acre plot of land on which the Sungai Besi air base is sited, the proposed 75-acre Kuala Lumpur International Financial District project near Jalan Tun Razak and the 3,300-acre Rubber Research Institute land in Sungai Buloh. In fact, part of the rationale for the MRCB-IJM Land merger was to give the merged entity an edge in developing the EPF-led development of the Sungai Buloh project. So, as the government releases more of its land to the private sector, it seems — ironically — to be taking a bite out of the companies that would most benefit from these projects. A market observer said there may be another reason for the government’s increasing interest in the property sector. “They may be acting as the buyer of last resort. 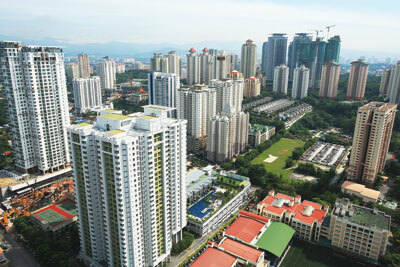 If you talk to developers, some of them think that Malaysia is already fully supplied with homes. Many families have multiple homes and have bought for the next generation. In addition, our household debt to GDP is relatively high at about 75%, so the propensity to borrow is limited. Thus, some developers may be cashing out,” he said. The increases in housing prices have generally lagged GDP growth since the end of the 1997-98 Asian financial crisis, but over the last two years there has been a surge in prices, which is generally regarded as making up for the lag in prices for the last decade. “Housing prices went up by an average of just over 3% annually while GDP growth in the same period was about 5% to 6% a year. The increases in housing prices usually track GDP growth, so there was obviously a lag. But it may be because housing supply increased substantially in that time. “In the last two years, however, there was a large jump in prices so it was more of a ‘catching up’ than the start of a bubble. After this one-off re-rating though, it is unclear if prices will continue rising and the housing developers may be cashing out,” the analyst added. This suggests the government could be functioning as a buyer of last resort, especially since there has been little foreign merger and acquisition interest in listed Malaysian property developers. Still, it could just boil down to attractive valuations. After all, the majority of Malaysian property stocks have generally — and long — been undervalued and most trade well below their revised net asset value, and some even below their historical book value. Thus, some of the acquisitions are seen as advantageous to the GLCs. One such example analysts cite is UEM Land’s purchase of Sunrise, which was priced at single price-to-digit multiples, and came with strong branding, a large pool of unbilled sales and a pipeline of ready-to-launch projects that will support UEM Land’s near-term earnings. But why only the high-end developers? “You don’t maximise your profit by selling cheap houses,” said Khoo.